“Natio” is the Latin word for “birth”. A “nation” can be defined as a group of people who are born in the same territory, feel embedded in a common history, and show common cultural characteristics. The idea of the “nation” started to play a crucial role in Europe only after the French Revolution, when the territorial states, ruled over by kings and queens, transformed into nation-states ruled by the nation through its parliament. 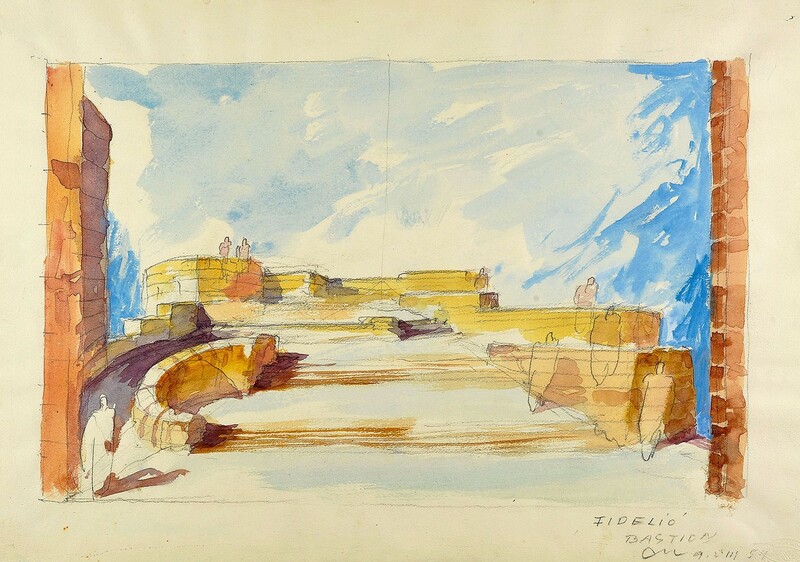 This transformation into nation-states is mirrored in the theatres: from the late 18th century onwards, “National Theatres” were founded to champion the national language, to present stories relevant to the nation, and to demonstrate that domestic artists could do this to artistic perfection. 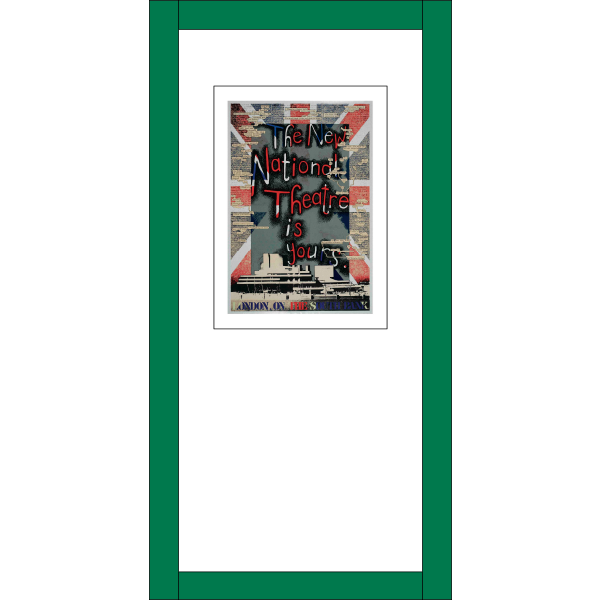 Furthermore, National Theatres played an important role in preserving the idea of the nation, e.g. when foreign powers annexed a country. Today, National Theatres do not have to fight anymore to establish a nation, but where they live up to their name, they continue to present the best of domestic drama and opera at the highest artistic level. In the 17th century, a provincial riding school was built on the location of future Estates Theatre. 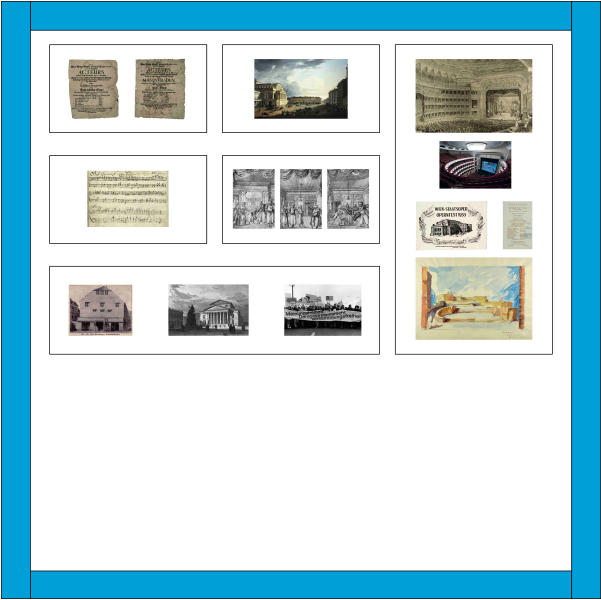 The first plans for changing it into an estates theatre were drawn up in 1756 by the architect Candido Zulliani. However, changes were implemented only 9 years later on the basis of plans by Lovrenc Prager, in preparation for a visit by the imperial couple, Franz I and Maria Theresa. The visit was cancelled due to the emperor’s death. The Baroque theatre building retained the ground plan of the former riding school, but an additional two floors were added. The auditorium consisted of the stalls with benches, seventy boxes at four levels and a gallery at the top. It held up to 850 people, which meant approximately a tenth of the population of Ljubljana at the time. The tragedy, written in German, belongs to “Sturm und Drang” dramas. 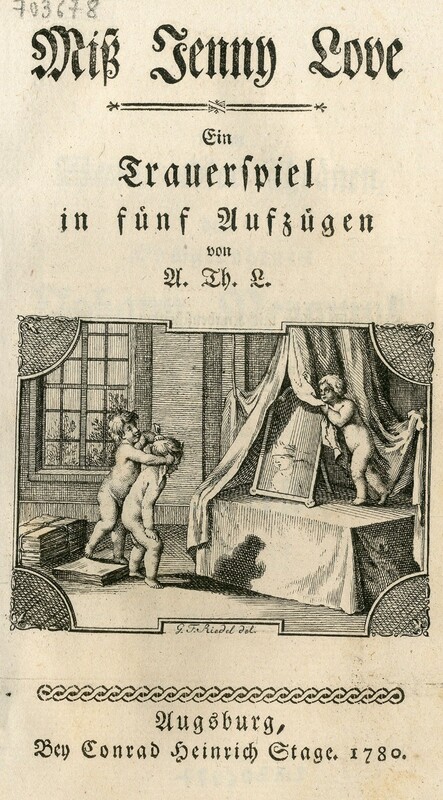 In 1780 Linhart wrote to a friend: “It will give me pleasure to send you a tragedy I have written and which has just been printed in Augsburg. It is as dark as a Shakespeare play; but I am afraid that it will have the honour of being banned from the Empire.” Linhart, fearful of the Viennese censor, published it in Augsburg in Bavaria. Until recently, the only known depiction of Linhart, the father of Slovene drama and (secular) theatre, was to be found in the almanac “Blumen aus Krain” (Flowers from Carniola) by the same author. Linhart is to Slovenes what Mozart is to Austrians and Schiller to Germans. It was not until the early 21st century that a second portrait of Linhart surfaced in the Austrian National Library in Vienna. 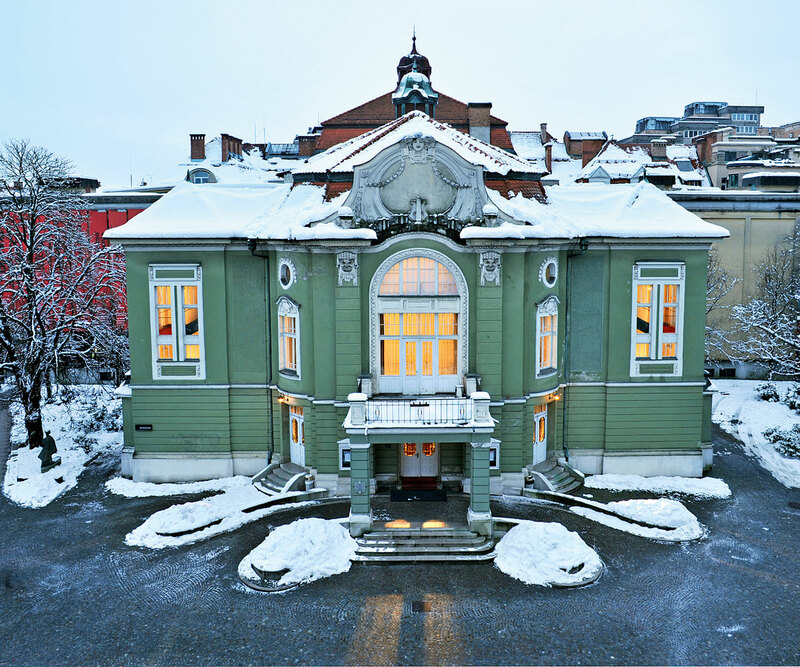 After the fire at the Estates Theatre burnt down in 1887 cultural life in Ljubljana needed a new centre. 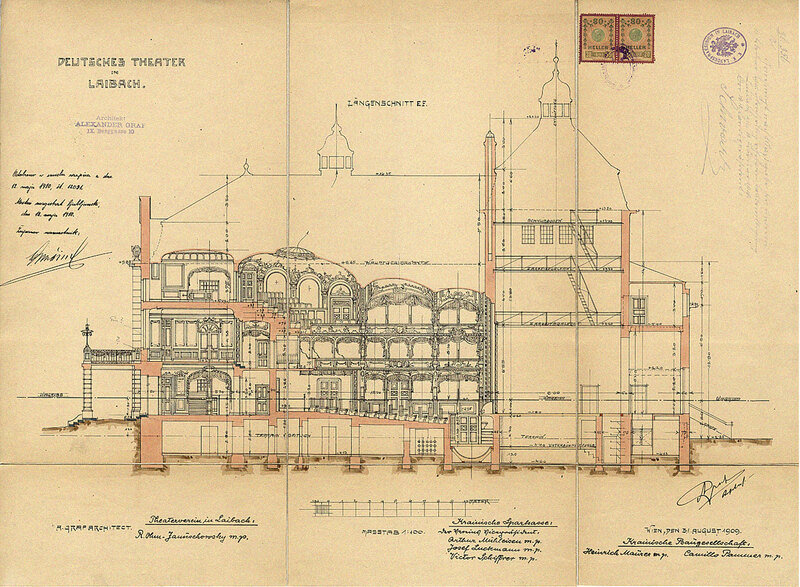 The plans of the new Carniolan Provincial Theatre were done by Czech architects Jan V. Hráský and Anton J. Hrubý (he was employed by the specialised Viennese company Fellner & Helmer, at that time the most reputable organisation for the design of theatre buildings in the Habsburg monarchy). 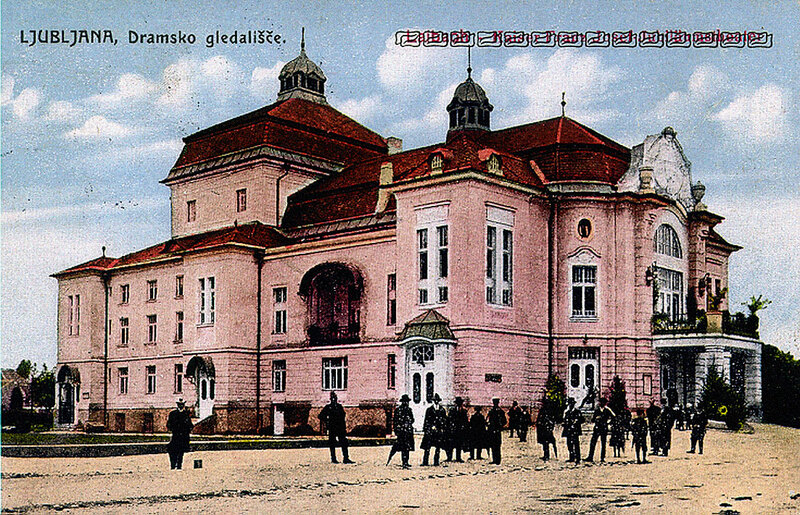 The festive opening of the Carniolan Provincial Theatre took place on 29 September 1892 with the staging of Slovenian tragedy “Veronika Deseniška” by Josip Jurčič. The Provincial Theatre – now the home of the Slovene National Theatre Opera and Ballet Ljubljana – was from the very start also intended for performances in Slovene and thus it took on the role of the central Slovene national theatre. 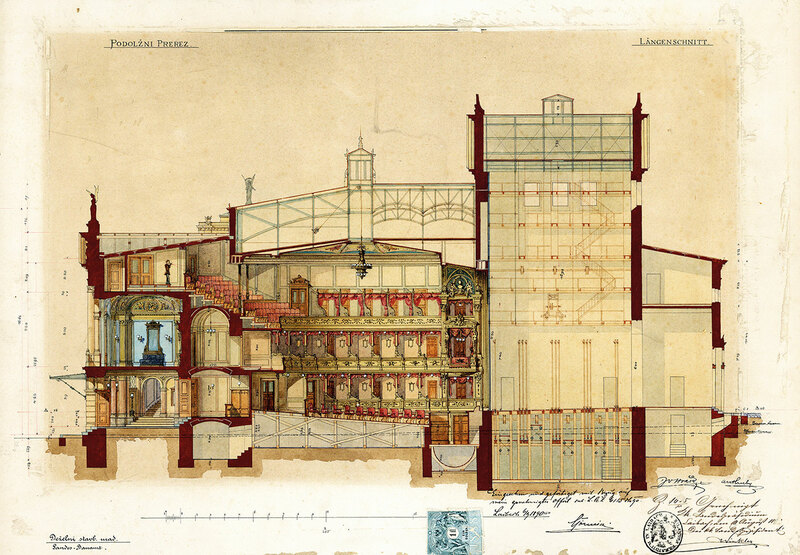 The initial plan for the new theatre in Ljubljana was created by the Viennese architect Georg Hladnig, but the design was rather clumsy and therefore rejected. Finally, Jan V. Hraský was selected. 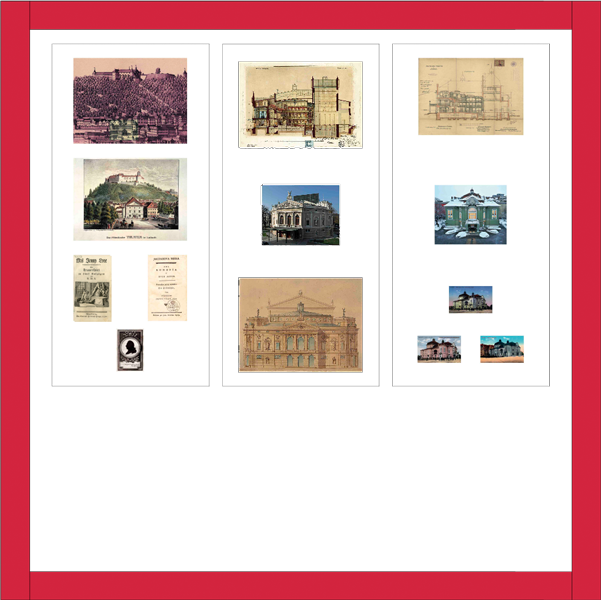 The selection of a Czech architect was a reflection of the general conditions in Slovene art and culture in the late 19th century, when the belief in the redemptive forces of Pan-Slavism was very strong. The German inhabitants of Ljubljana were unhappy about sharing the Carniolan Provincial Theatre with Slovenes and on the basis of plans by the Viennese architect Alexander Graf, built their own theatre. They called it “Kaiser Franz Joseph Jubiläumstheater” and open it in 1911. The end of World War I signaled the end of the German theatre in Ljubljana. The end of World War I signalled the end of the German theatre in Ljubljana. From that point on Slovene drama and the opera each had their own building – the former “Kaiser Franz Joseph Jubiläumstheater” (German theatre) is now the home of the Slovenian National Theatre Drama Ljubljana. Although the German population in Ljubljana was a minority (5,000 out of 30,000), at the opening of the Carniolan Provincial Theatre in 1892 it immediately demanded a number of dates for performances in German. Initially, all that was available for Slovenes were two days weekly. Gradually, Slovenes took the leading role, so Germans in 1911 opened their own theatre building, the “Kaiser Franz Joseph Jubiläumstheater”. The end of World War I signified the end of the German theatre in Ljubljana. From that point on Slovene drama and the opera each had their own building – the former Carniolan Provincial Theatre is now the home of the Slovenian National Theatre Opera and Ballet Ljubljana and the former German theatre is home of the Slovenian National Theatre Drama Ljubljana. The first theatre building in Ljubljana, Slovenia, was a wooden riding hall (top, around 1681). 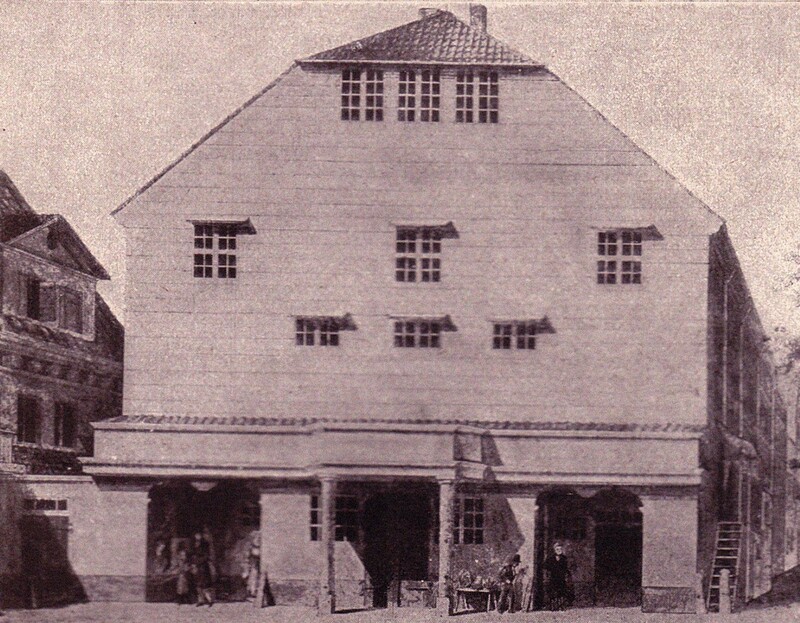 In 1765, it was converted to become the Estates Theatre (centre). Here Italian operas were presented as well as plays in German, as the Slovenian lands were part of the Habsburg Empire. Anton Linhart (silhouette) became the father of Slovenian secular theatre. 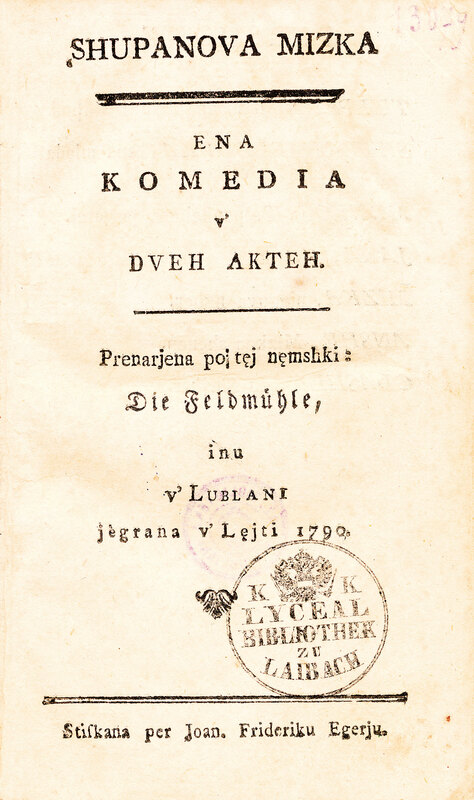 He wrote his first play still in German, but in 1789 he produced his first Slovene play. 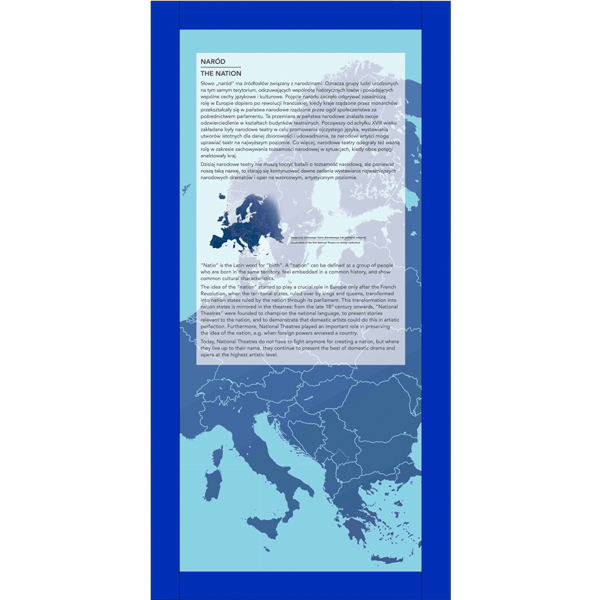 The development from wooden building to stone building and from adapting foreign plays to writing plays in one’s own language are common developments in many European countries in the 18th and early 19th century. 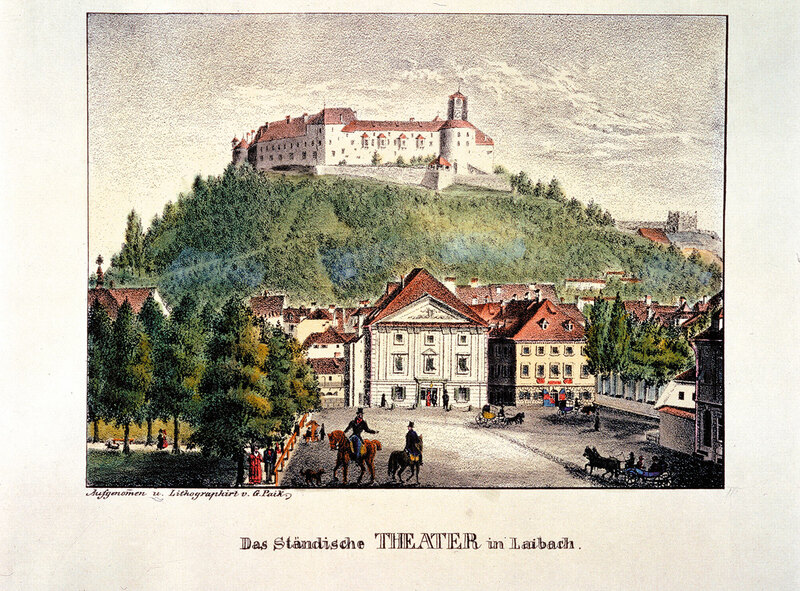 – The Estates Theatre in Ljubljana burned down in 1887. Two years later, the new Provincial Theatre opened. Here a German language troupe and a Slovene language troupe played in turn for their respective audiences. 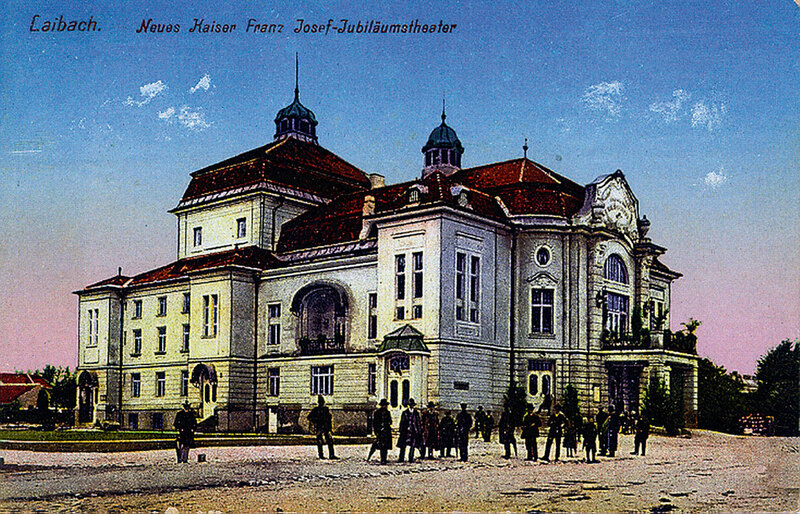 As nationalism grew stronger, the German language troupe moved into a new building: the Emperor Franz Joseph Jubilee Theatre, 1911. After World War I, all former Habsburg lands became independent states. 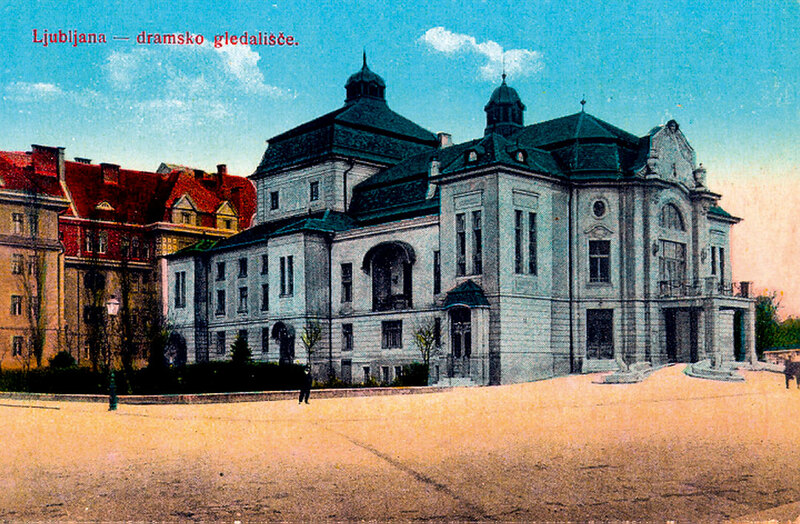 This transition is illustrated in the theatre postcards from Ljubljana. 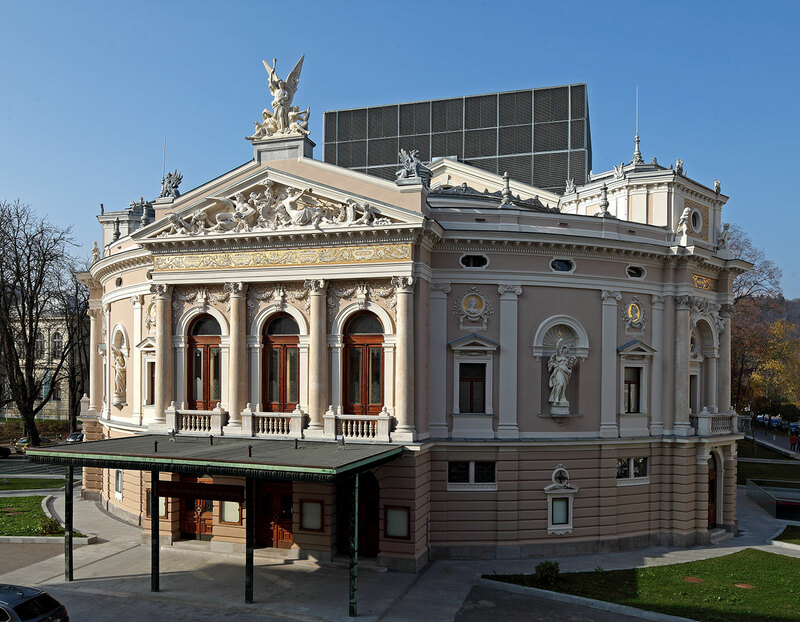 Today, the former Provincial Theatre is the National Opera House, and the former German theatre is the National Slovenian Drama Theatre. Some countries did not need to join the National Theatre movement in the 18th and 19th century, since they had already developed their theatre long before: mostly drama in Britain, Spain, and France, and opera in Italy. 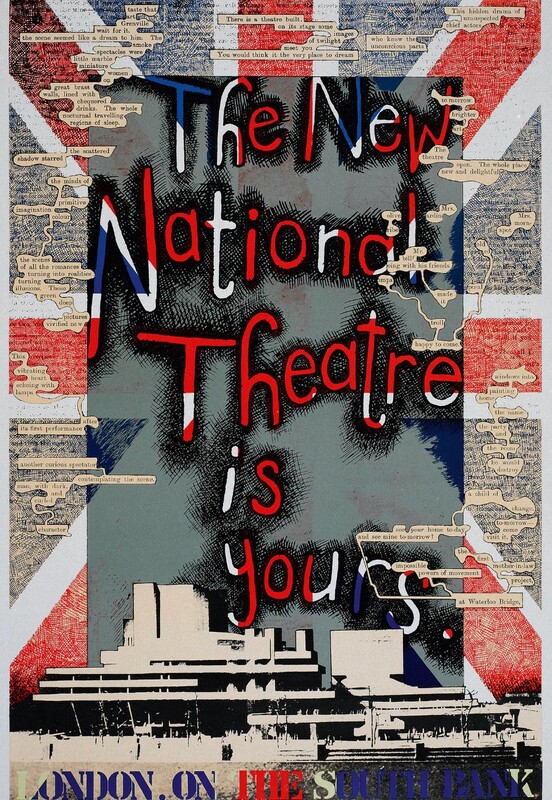 Nevertheless, a National Theatre opened in London as late as 1976 – at a time when the British Empire had come to an end and the nation needed to redefine itself. 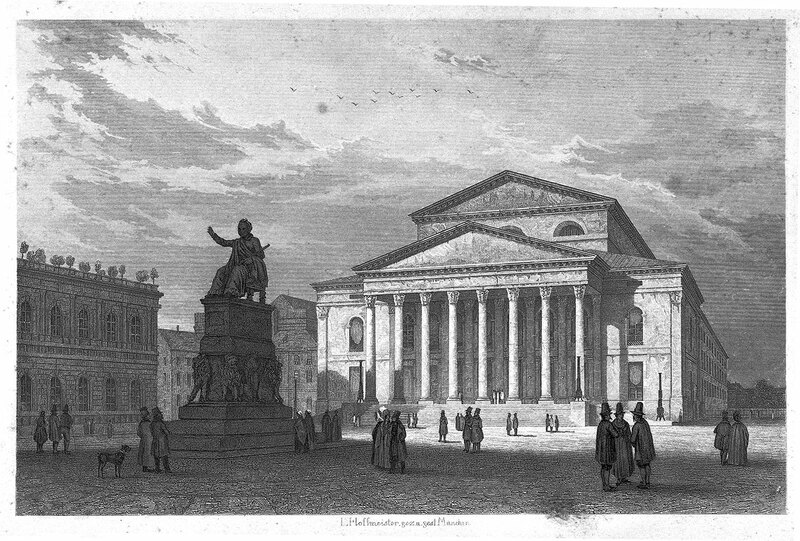 View of the theatre in Hamburg when it first opened in 1765. 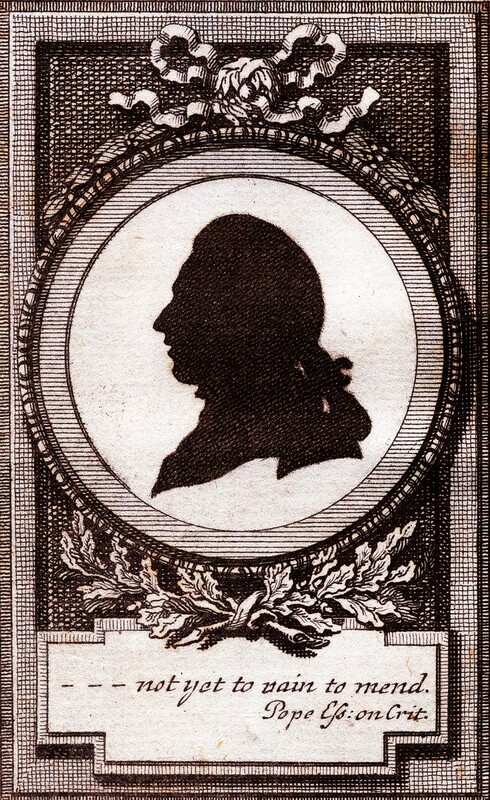 Konrad Ernst Ackermann’s touring company performed there, until in 1767 it became the so-called “Nationaltheater” with its own company, in which Lessing and Ekhof were involved. This phase, also referred to as the “Hamburger Entreprise”, only lasted until 1769. The first actual theatre institution in Denmark with tickets on sale to the public was The Comedy House in Lille Grønnegade, Copenhagen, which opened in 1722 and closed in 1728 after only six seasons. There is almost nothing left from this theatre, except a few posters and a drawing (anachronism) that shows the interior of the stage and the auditorium. With audience placed on the stage, the actors are playing comedy Jeppe on the Hill, which was later produced all over Europe, including Poland, Sweden, etc. The theatre in itself was an important institution and building for the development of a public theatre culture in the Nordic countries. 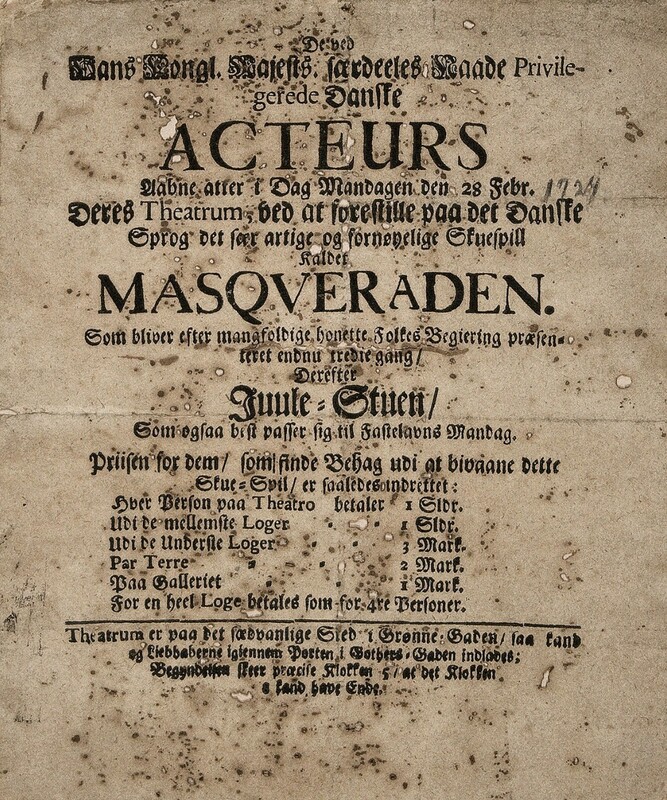 Furthermore, the comedy and the playwright Ludvig Holberg , were not only the breakthrough for Danish drama written and played in Danish, but also a breakthrough for the tradition of Commedia dell’arte and the French Molière comedy in a Nordic context. The first actual theatre institution in Denmark with tickets on sale to the public was The Comedy House in Lille Grønnegade, Copenhagen, which opened in 1722 and closed in 1728 after only six seasons. There is almost nothing left from this theatre, except a few posters and a drawing (anachronism) that shows the interior of the stage and the auditorium. With audience placed on the stage, the actors are playing comedy Jeppe on the Hill, which was later produced all over Europe, including Poland, Sweden, etc. The theatre in itself was an important institution and building for the development of a public theatre culture in the Nordic countries. 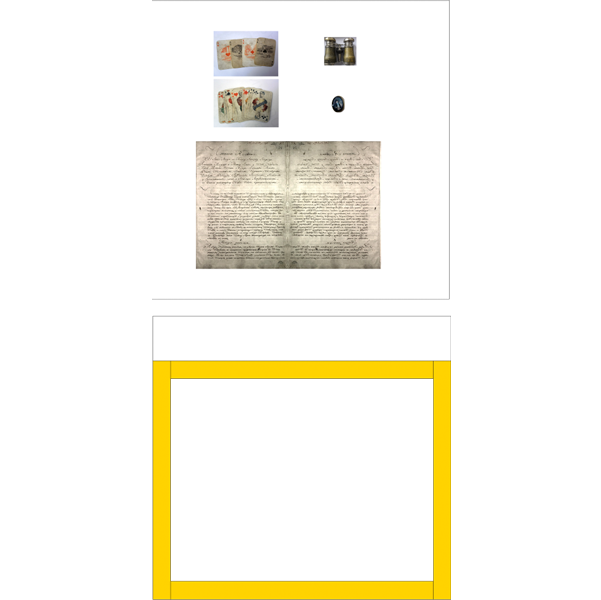 Furthermore, the comedy and the playwright Ludvig Holberg were not only the breakthrough for Danish drama written and played in Danish, but also a breakthrough for the tradition of Commedia dell’arte and the French Molière comedy in a Nordic context. Johann Friedrich Struensee, a physician from Altona in Germany, became a reformist in Denmark in the late 18th century and a frontrunner for the democratization of political power and public image, which did not break through in Denmark until many decades later. Being a cabinet minister, the highest office in the country besides the King, he introduced among other things press freedom as the very first. But in the political-military power circles probably he appeared too dictatorial and autocratic. Besides that Struensee and the young Queen Caroline Mathilde had a controversial and disastrous affair going on that was brought out into public during masquerades in the Court Theatre, just next to the King’s Castle in Copenhagen. 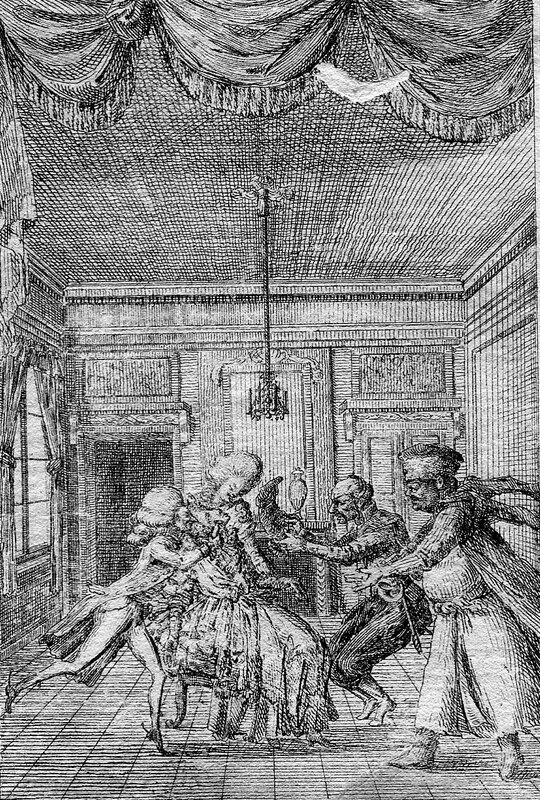 One day in January 1772 Struensee was at masquerade together with King Christian VI and Caroline Mathilde. One night after such a masquerade he was brutally arrested and escorted to the jail – accused and since then sentenced to death for lèse-majesté. 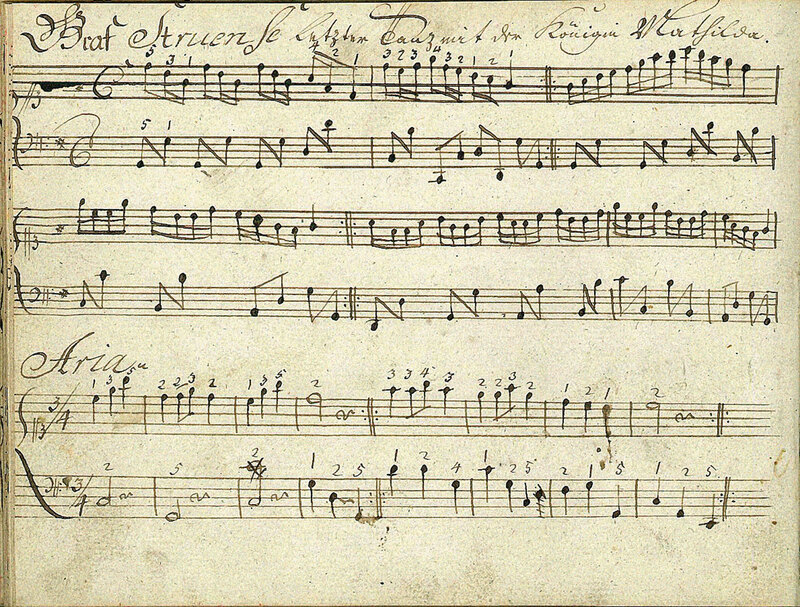 A music book, often used in the 18th century, shows the music played at Struensee's last ball. Above the score on this page the musician noted: "Graf Struense letzter Danz mit der Königin Mathilda" (Count Struensee's last dance with Queen Mathilda). 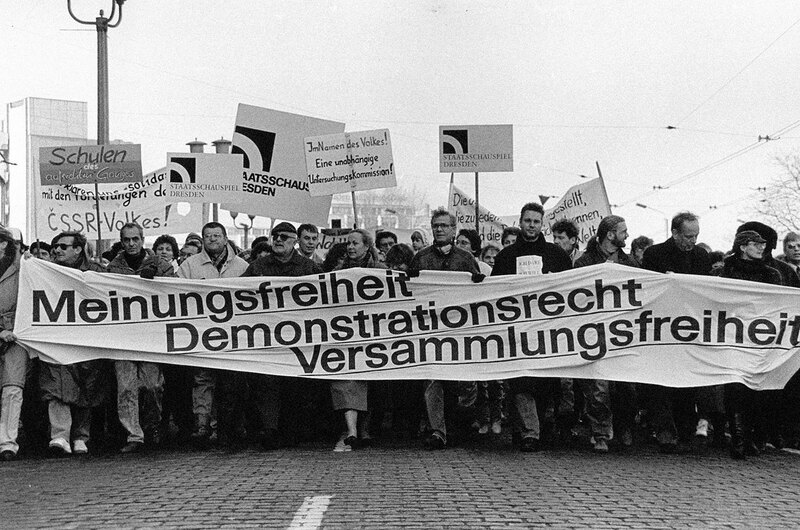 This demonstration with the slogan “We step out of our roles” was organized by the State Theatre Dresden and was part of the peaceful revolution, preparing for German reunification in 1989.
reopened in 1963. Interesting combination of court theatre and national theatre, also reflected in the name. 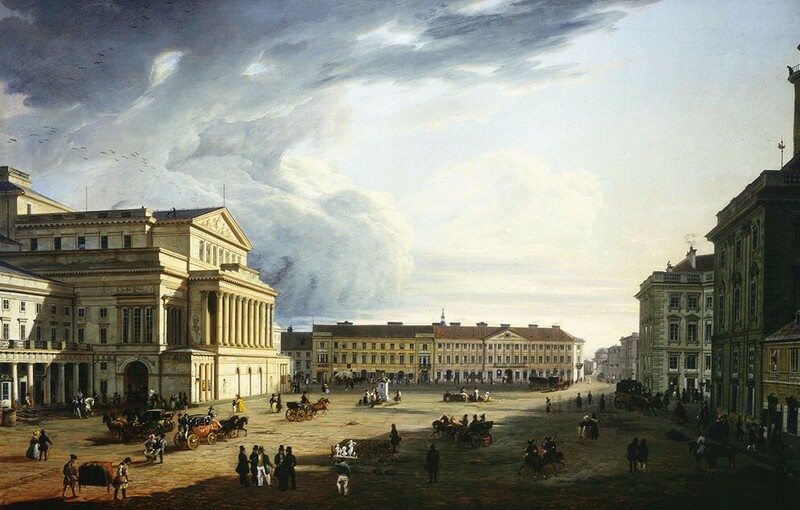 On May 25th, 1869 the new Court Opera House (now State Opera House) was opened in Vienna with the performance of “Don Giovanni” by Wolfgang Amadeus Mozart. 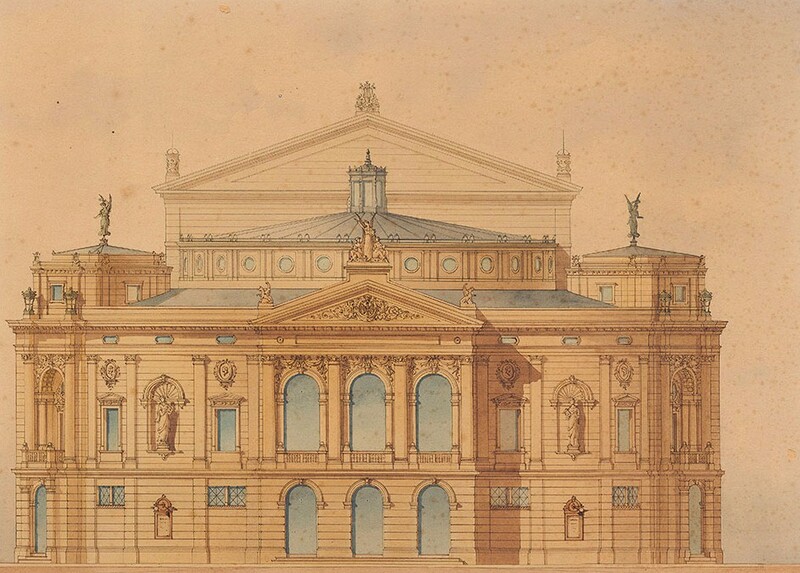 The opera house was the first major building on the Ringstrasse commissioned by the city expansion fund. The prestigious object was built in Neo-Renaissance style following the plans of the architects August Siccard von Siccardsburg and Eduard van der Nüll. Before 1869 operas were staged at the Kärtnertortheater (named after the former city gate – the Carinthian Gate), which was located near the new building on the grounds of the present Hotel Sacher. 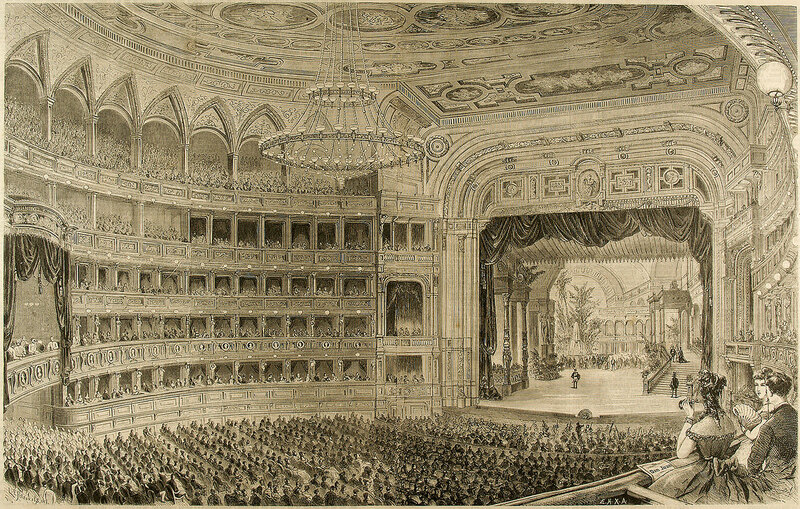 The old opera house, built in 1709, had become by the midst of the 19th century too small for the demands of a growing city’s audience and too old-fashioned according to the new technical standards. The picture gives a good impression of the enormous size of the auditorium and shows the relation between stage and auditorium as well as the relation between stage and the imperial gallery. 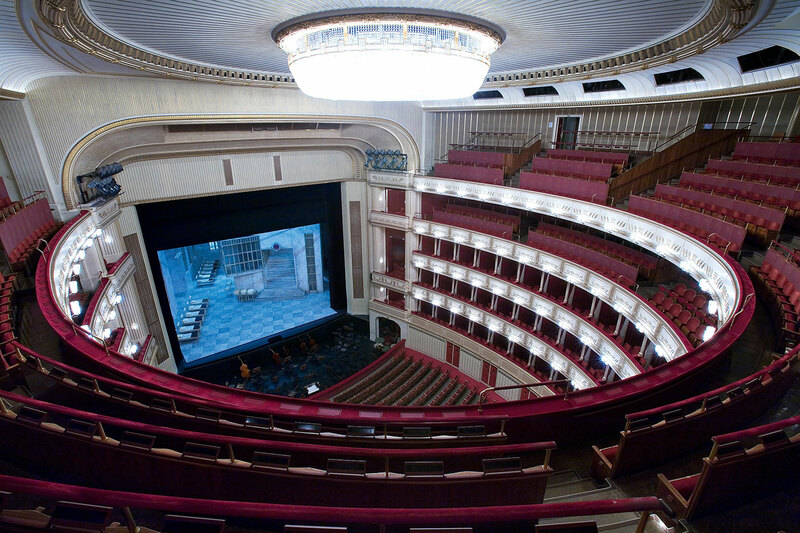 The opera in Vienna was badly damaged in WWII, and it took a long time to rebuild it. The auditorium features a much simpler design (compare the original interior on the engraving by Petrovits), whereas the grandiose staircases and foyers had survived and only needed to be restored. World War II left theatre buildings all over Europe severely damaged, and in many cities the question arose whether to build a new theatre or to rebuild the theatre from the ruins as it had been before. The city of Vienna decided to preserve the prestigious old building, and the State Opera was restored completely. The auditorium was all new but the principle of a structure with boxes forming balconies around the circle was kept as it had been during imperial times. The reopening was celebrated with a big festival of eight new productions in the very short period of less than four weeks. The first production was “Fidelio” by Ludwig van Beethoven. After World War II the State Opera in Vienna was finally reopened with a big festival in 1955 and “Fidelio” was the first opera to be performed on 1955 November 5th. Since the prestigious State Opera is an important national symbol of culture the board of directors had chosen for the first night an opera by Ludwig van Beethoven. Suiting the occasion, the work tells a story of liberation from tyranny. For this production the most renowned artists and singers were engaged, as the list of names and the signatures on the playbill shows. The stage was designed by the well-known Austrian architect and stage designer Clemens Holzmeister. 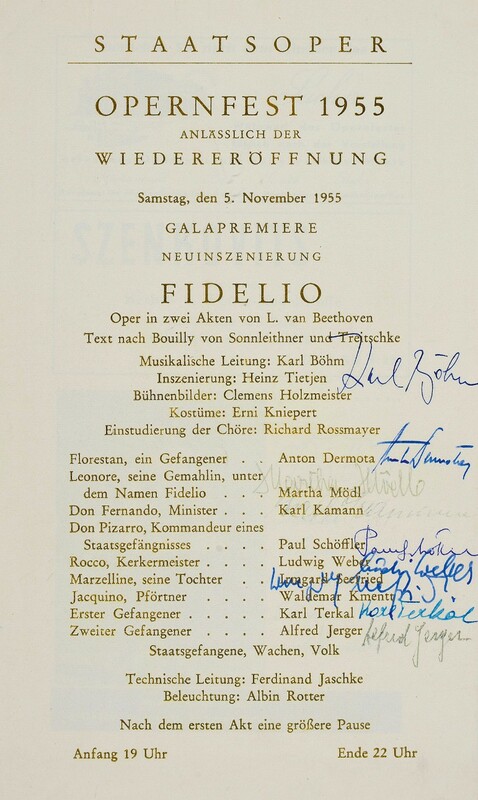 After World War II the State Opera in Vienna finally reopened with a big festival in 1955, and “Fidelio” was the first opera to be performed on 5 November. Since the prestigious State Opera is an important national symbol of culture, the board of directors had chosen for the first night an opera by Ludwig van Beethoven. Suiting the occasion, the work tells a story of liberation from tyranny. For this production the most renowned artists and singers were engaged, as the list of names and the signatures on the playbill shows. The stage was designed by the well-known Austrian architect and stage designer Clemens Holzmeister. French was the source for most plays in the 17th and 18th century, as Italian was for opera. 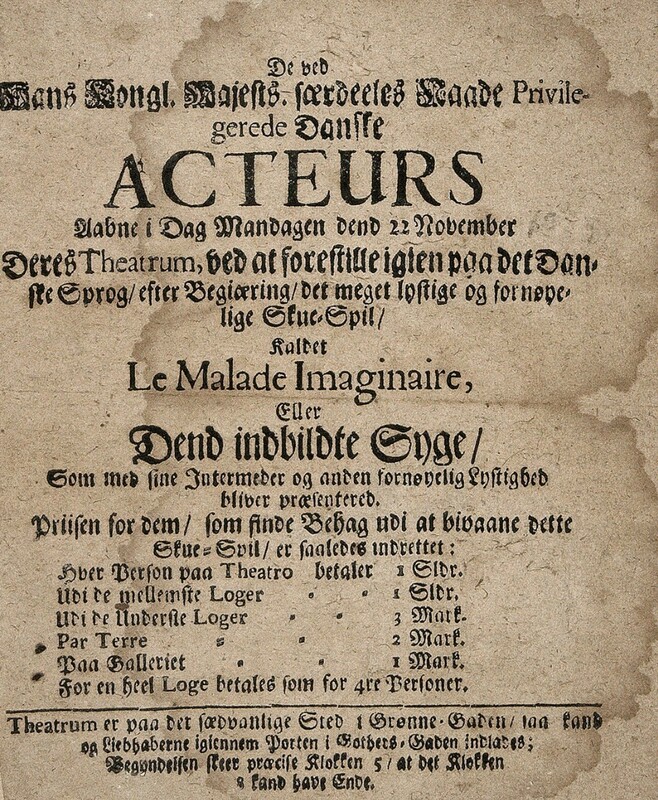 In Denmark, performances in Danish started with adaptations of plays by Molière (playbill 1673), later to be replaced by home-grown comedies (playbill 1723). But a nation also needs able politicians who carry out reforms – and may get killed for it, like the Danish reformer Struensee after a ball in the Court Theatre in 1772, where he danced his last dance to the above tune. National Theatres are high quality repertory companies, and these can only exist with public funding or reliable donors. 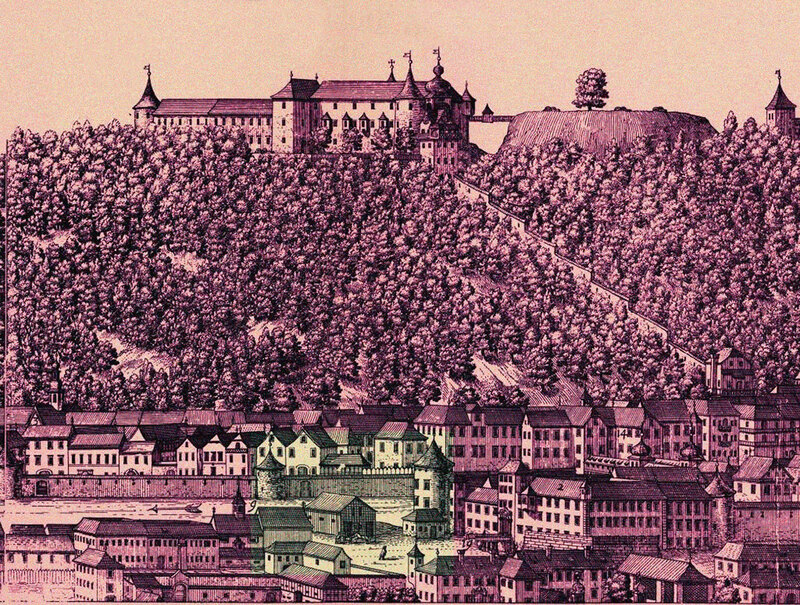 The first National Theatre in Germany (bottom left) did not have either and promptly closed after one year, in 1768. A clever move to reconcile the ruling aristocracy with the bourgeoisie was to rename a court theatre and make it a “Court and National Theatre”, as in Munich in 1818. Promoting change: actors of the Polish National Theatre (top centre: the Teatr Wielki in 1838) performed the play “The Return of the Deputy” (below) in 1791, urging the National Assembly to finish the new Constitution; whereas actors in East Germany took the street in 1989, demonstrating for civil rights. National Theatres became so important that their re-opening after a war turned into a national celebration, e.g. 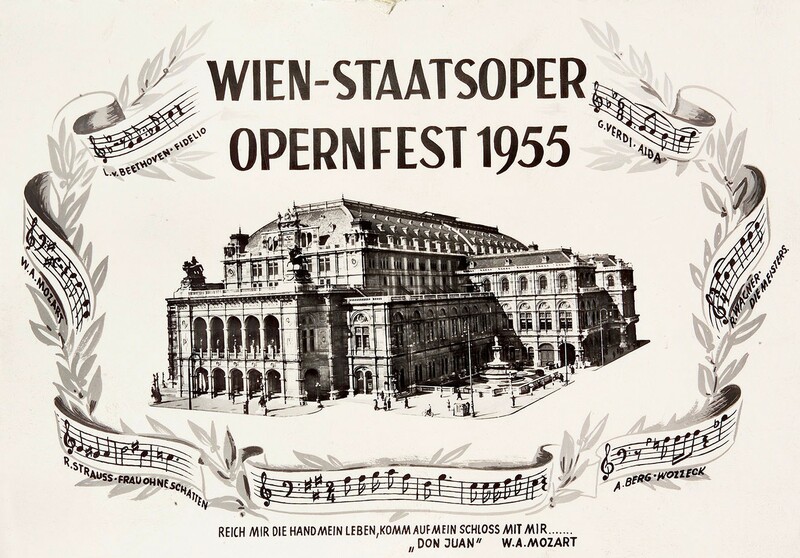 in Vienna when the Opera had been restored in 1955, ten years after World War II. The adoption of the Polish constitution of 1791 was perceived as being such a threat to monarchy, that Prussia, Austria and Russia marched into Poland and partitioned the country among themselves. Thus Poland vanished from the map of Europe until 1918. The constitution was given by Stanislaw August, king of Poland, together with "confederate Estates", representing the Polish nation. Form of Government, or the Definition of Public Powers. All power in civil society should be derived from the will of the people, its end and object being the preservation and integrity of the State, the civil liberty, and the good order of society, on an equal scale, and on lasting foundation. Three distinct powers shall compose the government of the Polish nation, according to the present constitution; viz. 1st. Legislative power of the Estates assembled. 2nd. Executive power in the King and the Council of Inspection. 3rd. Judicial power in Jurisdictions existing or to be established. The King, or Executive Power. Depicted are the following theatres: Teatr Wielki (Great Theatre), Polish Theatre, Theatre on the Island in Royal Łazienki Park, and Warsaw Philharmonic. 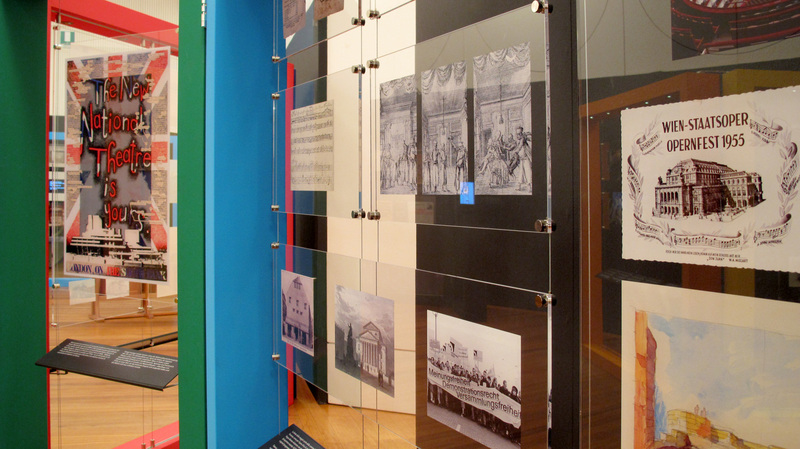 The opera-glass demonstrates that the Teatr Wielki was managed by the Russian Government. It was not allowed to call itself “National Theatre” but had to take the neutral name “Great Theatre” (Teatr Wielki) which it still uses today. The Polish language, however, was present in Warsaw Government Theatres, as Russian officers enjoyed practising the 'western' language out of snobbery. Some Russian officers even sometimes became Polish patriots. 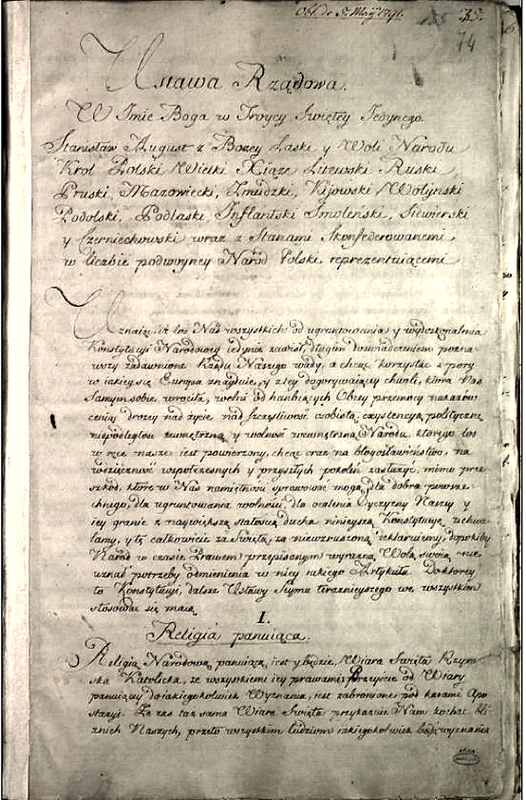 The adoption of the Polish constitution of 1791 was perceived as being such a threat to monarchy, that Prussia, Austria and Russia marched into Poland and partitioned the country among themselves. 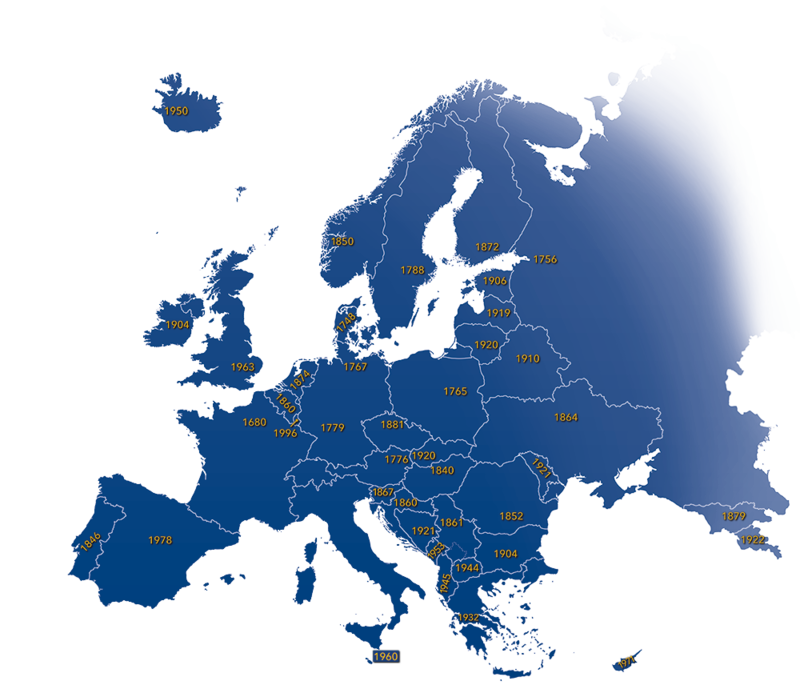 Thus Poland vanished from the map of Europe until 1918. The Polish National Theatre, founded in 1778, helped Polish identity to survive in these difficult times, as did other Polish theatres and Polish actors. 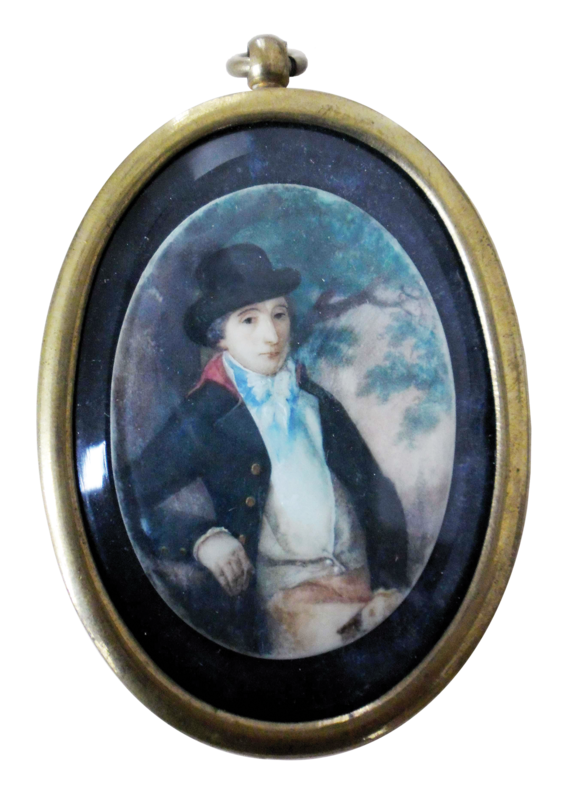 Miniature of Wojciech Bogusławski (1757–1829), the father of Polish drama. 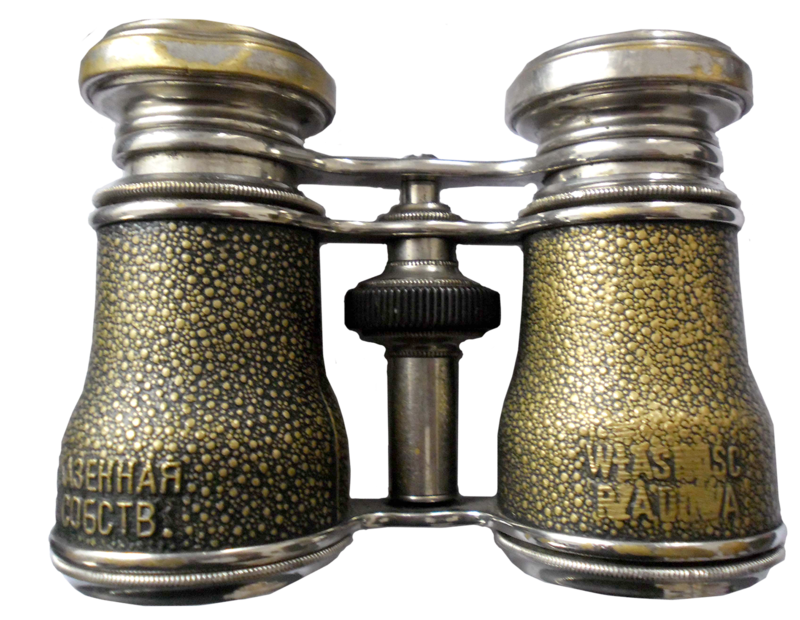 Binoculars from the Teatr Wielki in Warsaw with Russian and Polish inscription, ca. 1900. 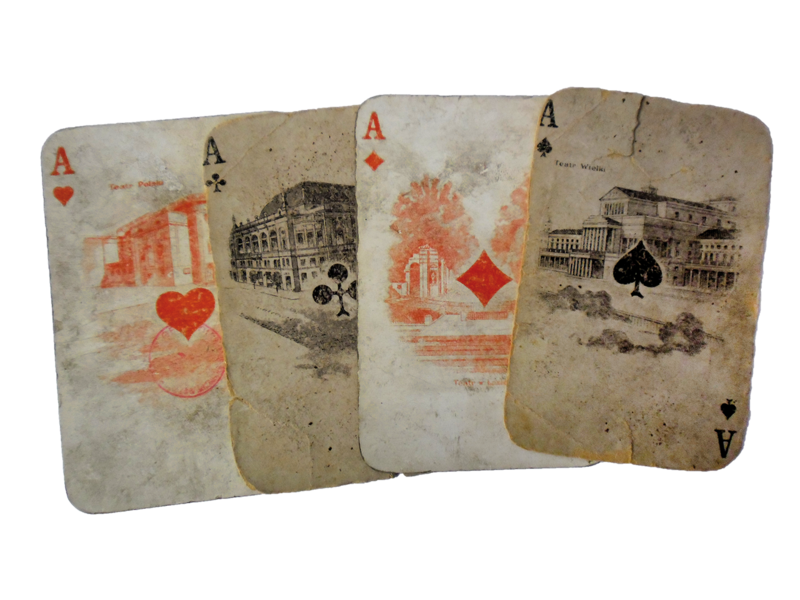 Playing cards depicting Polish theatres and actors, WWI.